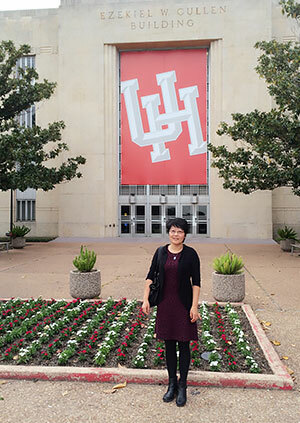 Hongkun Zhang joined the University of Houston’s Department of Mathematics this fall as an associate professor. Her primary research field is statistical properties of stochastic processes generated by dynamical systems, including chaotic billiards. She is teaching a graduate course in Probability and Statistics. Through the project, Zhang seeks both a theoretical understanding and new ways to connect mathematical ideas to a variety of complex phenomena. The work, focusing on statistical properties for nonequilibrium billiards and properties of SRB measures and related physical laws, will use spectral analysis, coupling methods and other innovative approaches. Zhang’s research will address applied problems in physics, chemical engineering and other sciences. Zhang hopes to integrate her research into curriculum development, including new graduate-level topics courses on aspects of Stochastic Differential Equations and Machine Learning. Prior to joining the UH faculty, Zhang served as an associate professor at University of Massachusetts Amherst. She received her bachelor’s degree from Inner Mongolia University and her Ph.D. in 2005 from the University of Alabama at Birmingham.